Inside the Mind and Heart of Frank McCartha, Jr.
Frank McCartha, Jr. is one of America’s most respected horse and dog show judges. He does Hound, Working, and Herding Groups and is also the owner of Heritage Farms Miniature Horses and Training Center in Chapin, South Carolina. 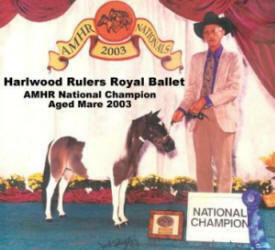 He and his wife Faye became involved with Appaloosas and Quarter Horses in 1955, purchased their first Miniature Horses in 1986 and quickly became known for breeding top-quality spotted Miniature Horses, including Pintos. Frank shares an affinity for spots with Don and Betty Lou Wood who bought their first Miniature Horses from Heritage Farms. The Woods have enjoyed great success in both dog and horse show competitions. 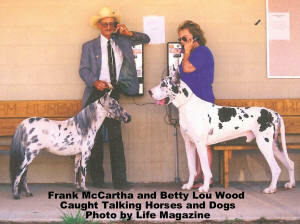 Mr. McArtha is pictured with Betty Lou Wood and one of her Harlwood Great Danes, AKC Champion Rhondo. Interestingly, the magnificent dog is taller than the Appaloosa mare, which according to their respective judging standards, is as it should be. For our readers who might not know the terminology, does "Aged Mare" mean the delightfully diminutive "pinto" was an old horse? McCartha judges all AKC Hounds, Working, and Herding breeds, plus several Sporting breeds. 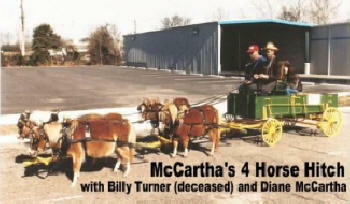 Unfazed by fame, McCartha is known for finding the best exhibits, whether they are handled by professionals or awkwardly presented by a novice. When asked about his reputation for fairness, Frank became serious. “Everyone started out as a novice. We’re judging the exhibit, not the skills of the trainer or handler. 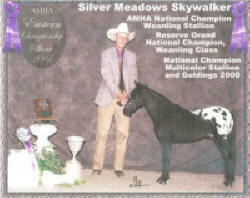 As long as the animal is clean and the breed type and movement can be seen, it can win under me." 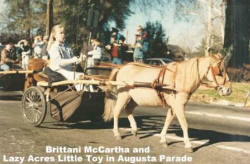 The McCarthas run about 100 head of show horses, herd sires and brood mares centered on the nation’s leading bloodlines. Heritage Farms competes in Halter and Driving classes. Frank and Faye support all Youth Exhibitors, including of course, their lovely Granddaughters Britanni McCartha and Amber Williams who is always at the top of her class in Pleasure Driving and Youth Showmanship. Successful horse breeding is a challenge compared to dogs or cats which have multiple offspring in a litter. A mare has only one foal per year, thus getting the genetic combination just right is crucial or there’s a long wait before the breeder can try again. Kids, horses, dogs; they all come together at Heritage Farms where “seeing spots” is synonymous with quality and devotion.